We are the Greatest scientific minds of the world. We influence every aspect of human society. We protect the Earth from the aliens without and the deviants within. Through order, science and technology, our conventions shape the course of the furure and catalog the wonders of the cosmos. We are there whenever someone uses a tool. We create the advancements that protect and comfort humanity. We decide how tomorrow improves beyond today. If you are ready to shape the world and willing to sacrifice yourself for humanity, you can be one of us. 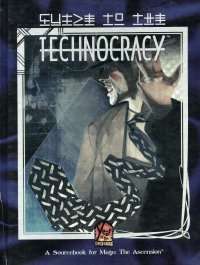 All the information needed to run a Technocracy - based Chronicle: Technocracy characters, new Abilities, Devices and Procedures, Technocratic organization and more. Explore the defenses of Technocratic bases, their corridors of political power and their hopes for the future. Discover how they deal with supernatural threats and what wonders they uncover. Learn the Union's beliefs and goals, and how it plans to empower all of humanity.